I've opened Parmanoir two months ago. I talk about Cocoa. 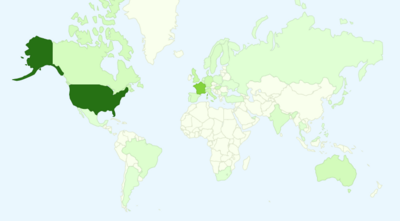 Not many people have visited yet … but it's still interesting to see where visitors come from ! I've setup Google Analytics quite early and done all coding online. That's why France is overrepresented, it counts my many refreshes as multiple visitors. 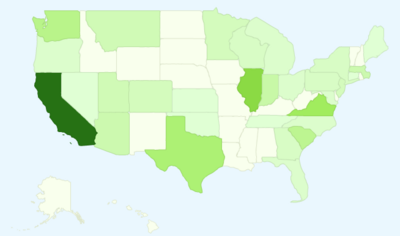 Colors go from light green (few visitors) to dark green (most visitors), no one came from the blank countries. Looking at the whole world, we can see that USA loves Cocoa, Western Europe likes Cocoa, Asia not that much and Africa doesn't care. Let's zoom in on the US. California loves Cocoa ; Illinois, Virginia, Texas like Cocoa, and a top left to bottom right diagonal doesn't care. 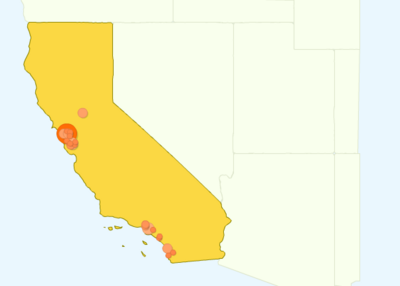 Let's zoom in on California. What's that big spot in the middle ? Hint : where's Apple HQ ? Apple, you need to spread it. View the world as a big tartine and share the chocolate. Does it count RSS readers too? 'cause when you have (like me) NetNewsWire configured to refresh feeds every hour, it increases the daily number of hits by a larger factor than just web visitors.